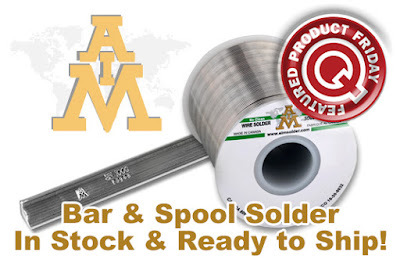 Our save 10% off Q Source’s already low prices on AIM Solder In-Stock, Ready-to-Ship Products promo was so nice, we figured why not do it twice. Just use our FPF110615 Coupon Code (auto applied) to get the discount. This Featured Product Friday (FPF) promo is valid from today, November 6, 2015 through Sunday, November 8, 2015. As we told you last week, these top-quality in-stock solder products include selections from AIM’s FastCore, GlowCore, and Water-Soluble series. This 3-day offer is unlimited. Use the code as many times as you like while it is valid—and we encourage you to share the code with your friends and colleagues. For further questions about Featured Product Friday, please read our informational blog post, call us (800-966-6020), or send us an email. Please note: This promo is valid only at QSource.com and expires on November 8, 2015.